(Seychelles News Agency) - As Creole nations worldwide celebrated the 32nd International Day of the Creole language, on Thursday October 28, Seychelles saw it fitting to honour one person who had the determination and passion to ensure the development of the Creole language in the Indian Ocean island nation. 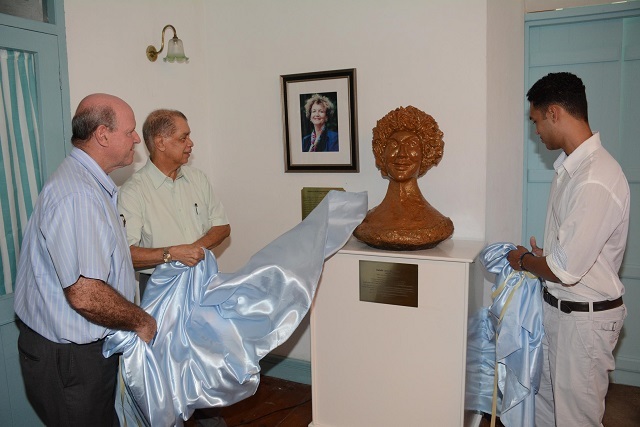 A sculpture of the late Danielle Jorre de St Jorre was unveiled at 'Lenstiti Kreol' [the Creole Institute] at Au Cap, on the eastern coast of the main Seychelles island of Mahé. De St Jorre, who passed away in February 1997 at the age of 55, was a teacher by profession and also a linguist. She was part of an association, ‘Bann Zil Kreol’ [Creole islands] formed in 1981 bringing together Creole speaking islands. It was the association that fought for October 28 to be officially recognized as the International Day of the Creole Language in 1983. Creole, which is mainly derived from the French language, is the native language of the Seychelles islands and resulted from the descendants of settlers from Europe, traders from Asia and former slaves from Africa, who later intermarried forming the melting pot of culture which exists today finding their own means to communicate and understand one another. The islanders can communicate with their southerly Mauritian neighbours in their slightly different Creole, and with others who speak distant dialects of the same language from as far as Haiti and several Caribbean island nations. Honouring the work of de St Jorre also comes now that Seychelles, an Indian Ocean archipelago of 115 islands with a population of around 93,000 people is celebrating the 30th Festival Kreol [Creole Festival], an annual celebration of the Creole culture. Interestingly, she was also the person behind the organization of the first Creole week in 1982 and the first Creole Festival three years later, in 1985. “Today’s ceremony is to honour the greatest pioneer in the development of Creole, in all aspects...the language, culture, policy and infrastructure,” said Penda Choppy, the Director of the Creole Institute. Choppy also noted that the venue of Thursday’s event, the Creole Institute, is another project realized by de St Jorre, as she was the one who sought the finances for the renovation of the building, in the 1980s, with the aim of using it as the headquarters of the Creole Institute. The Creole Institute serves to promote research on the structure of the creole language, production of Creole literature, the development of the Creole language mainly among the Seychelles’ population of 93,000. Yann D’offay- Mancienne, the 19-year-old grandson of de St Jorre, who was in fact, celebrating his birthday on Thursday, told SNA that he was very proud of his grandmother and described the event as “you could say it's my birthday present." Anne Laure Mancienne, de St Jorre’s daughter, told SNA that Creole was her mother's passion, a person whom she also described as a 'remarkable woman'. The art sculpture of Danielle Jorre de St Jorre, which is made of concrete and resin finish is the work of Seychellois artist and sculptor Egbert Marday, who was one of her students when he was only 15, and who later worked with her to set up the Seychelles Natural History Museum, situated in the heart of the Seychelles capital of Victoria. Marday explained to SNA that his sculpture attempts to depict the personality of the young and enthusiastic woman that de St Jorre was, and the strong and determined woman she tuned out to be during her teaching years that followed. “I tried to her define her personality from the young lady that she was....dynamic....articulate, to what she became later on in her life,” Marday told SNA. The Seychelles Minister for Tourism and Culture Alain St Ange described the initiative as something that will inspire the generations to come to appreciate those who came before them and what they achieved for the country. 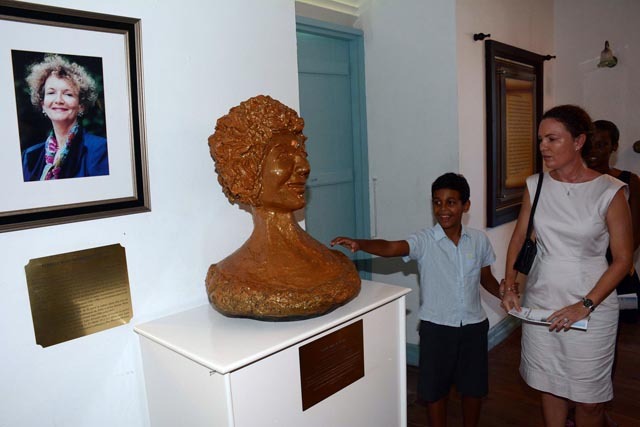 “Starting something is very difficult …I salute Danielle de St. Jorre for having been bold to immerse herself in the endeavor to promote the Creole language at a time when creole was not totally accepted [in Seychelles],” said St Ange. Aside of her work as a teacher and linguist and her dedication to promoting the Creole language, de St Jorre has also held several other key positions in the country. She was the Director of Teacher Training College before she became Principal Secretary of the Ministry for Education and Information in 1980. 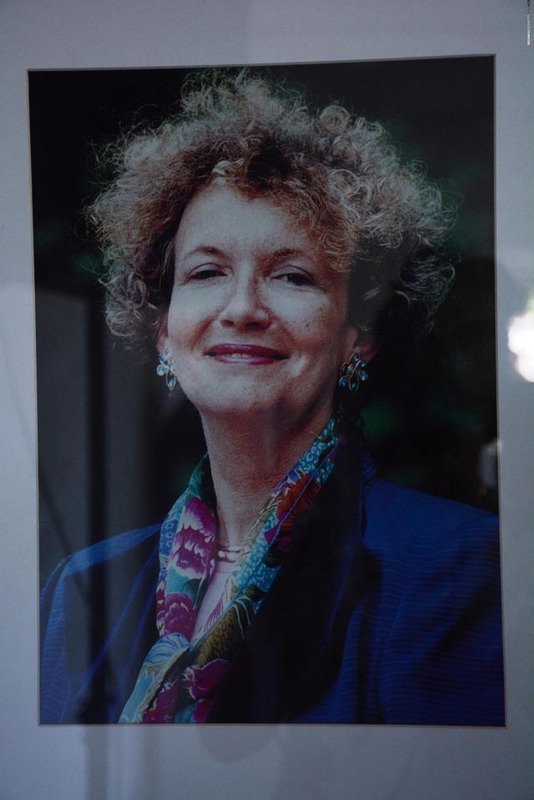 She was also Seychelles ambassador in France in 1983, and the last position she occupied was that of Minister of Foreign Affairs, Planning and Environment from 1993 until 1997, the year she passed away. She also worked alongside other individuals on publications aimed at promoting the Creole language including the first French-Creole bilingual dictionary together with Guy Lionnet. 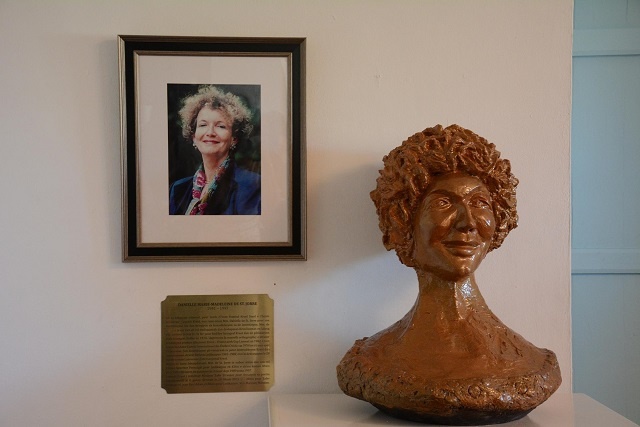 Danielle Jorre de St Jorre is the second Seychellois to be honoured and have her own sculpture unveiled at the Creole Institute, after Antoine Abel, a renowned Seychellois poet and writer also considered ‘the father of Seychelles Literature’.